This is the skins with its broad band of scales down the middle; leg leather resembles reptile skin rather than traditional ostrich leather. Because leg skins yield narrow strips of leather, it is mostly used for small leather items and footwear. 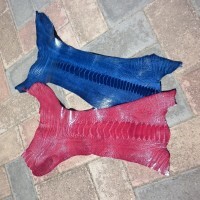 High quality genuine ostrich leg skins. Leathers are tanned and dyed by top exotic leather tannery in South Africa, with big colour selection. Glaze finish is mainly available. Leathers are suitable for wallet, handbag, shoe and furniture manufacture. We are a trading company specializing in exotic leather/skins, such as ostrich, ostrich leg skin, buffalo, springbok and zebra from southern africa. We source leather from country of origin, south africa, which has the best experience and skill on handling exotic leathers. We are especially specialized in ostrich leather and other game skin trading business for bags, shoes, furniture, and get direct access to the ostrich leather country of origin. If you have inquiry, please feel free to contact us.